1. To prepare noodles, cook in boiling water 1 1/2 minutes and drain. Rinse under cold water. Drain and place in a large bowl. 2. To prepare the sauce, place lime juice and next 4 ingredients in a blender, and process until smooth. 3. 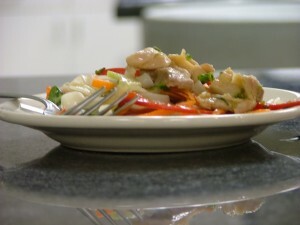 To prepare chicken, heat oil in a large nonstick skillet over medium-high heat. Add chicken, sauté for 3 minutes. Stir in shallots. Cook one minute, stir constantly. Add sugar, cook 5 minutes, stirring frequently. Remove from heat, stir in 1 TBSP. fish sauce and black pepper.